Support: Content Management Systems will require patching and support throughout their use, including web development support, hosting, mentoring for users and management, and strategic guidance. These features help ensure that projects remain relevant and that any issues are found and addressed quickly. Strategy: A good implementation partner who has experience with CMS systems can deliver realistic strategies that bring value to a business. Having an appropriate CMS strategy, based on an accurate analysis of corporate and consumer insights, helps ensure that companies are aligned with the needs of their users as well as with their own growth goals. Stability: Companies engaging with CMS need to identify the core features of their strategy to provide a strong foundation for growth. This allows them to meet the needs of a growing user base, as well as face the complexities associated with growth in a modern marketplace. Implementation partners come in all shapes and sizes and can promise businesses a range of features. However, what is promised and what is delivered may not always match up, which is why utilising a partner who understands what is needed, as well as what is possible in the long and short term, is critical. When a CMS project has gone sideways, companies may begin looking for partners who can implement a project rescue and restore their productivity. These partners must understand the company’s process, personality, pay scale, and project needs – and have a strategy to meet each throughout the implementation process. How many projects of a similar size has this partner been part of? Does this partner provide constant resources throughout implementation? Can existing tech teams mingle with partners during development to share knowledge? Does the partner offer a periodic audit of implementation to help ensure that best practices are being followed? Will the partner provide a warranty period during which problems with requirements that were promised but not delivered can be resolved? 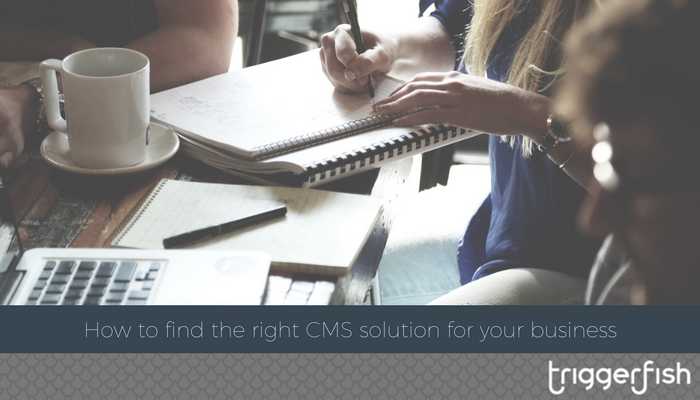 If you are having trouble with your CMS system, or if you are looking to implement a CMS solution but don’t know where to begin – contact Triggerfish today. As a conversion optimised, growth-focused partners, we believe that deep, unique relationships with customers are at the heart of profitable growth. We look forward to hearing from you - and helping you build a CMS strategy. Get on The Lure and get in touch today.